Roz King finished a great week with wins in singles and doubles in Poertschach. She beat Lyn Tietz, USA, in three tight sets and combined with Kathy Langer to win the doubles over Nola Collins/Margaret Robinson in two close sets. Clem Hopp, USA, won the singles and finished 2nd in doubles (with Hugh Stewart, USA) in the men’s 85 division. Heide Orth took the 70 singles title. Pat Jackson/Nicolas Ourusoff USA won the mixed 75s. June 14th: It’s an all-American final in Austria. Roz King beat the top seed, Von Boemel, in straight sets and Lyn Tietz edged Burnett Herrick in three sets to reach the singles final. In doubles, King/Kathy Langer beat Dorothy Wasser/Herrick 75 75 and Tietz/Haynes lost to Collins/Robinson. June 13: Three Americans into the semis along with top seed. Kathy Langer fell in three sets to the #1 seed, Elisabeth Von Boemel, but Lyn Tietz (over #3 seed), Ros King (easily) and Burnett Herrick (over #2 seed in three sets) all advanced to the semis of the European Championships. King plays Von Boemel and Herrick plays Tietz. They did even better in doubles: Dorothy Wasser/Herrick beat the #1 seeds easily; Caroline Haynes and Tietz beat the #2 seeds 61 75; Langer/King, seeded #4, won as well. King/Langer play Herrick/Wasser; Haynes/Tietz play Aussies Nola Collins and Margaret Robinson. Tad lost his next match after beating Alle. 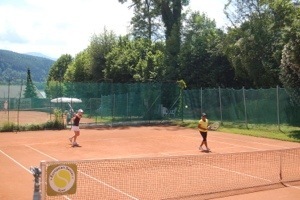 June 12, Wednesday Update; Four Americans into the quarterfinals in Austria: Kathy Langer, Roz King, Lyn Tietz and Burnett Herrick all won today and Burnett beat the 5th seed. Caroline Haynes fell to #2 seeded Nola Collins from Australia. Kathy plays the #1 seed tomorrow, Burnett plays the #2 seed, Ros doesn’t play a seed and Lyn plays the the 3rd seed, who won a tough three-setter today. Doubles has not yet been posted. Kathy Langer beat the #7 seed Christa Haas today 60 63; Roz King went one better, upsetting the #4 seed Ilse Michel, 63 20 retired (all those drop shots? ); Lyn Tietz, the only seeded American, won as did Caroline Haynes and Burnett Herrick. This was a 64 draw (in women’s 75 singles!) with many byes so the round of 16 is tomorow. There are 14 doubles teams; King/Langer are the #4 seeds; Tietz/Haynes and Herrick/Wasser are also playing. Linda Friedlander, Esther Williams and Ingrid Rehwinkel are also playing; Dorothy Wasser has a German partner for mixed and Pat Jackson is playing mixed too. In men’s action, I noticed that American Tadahi Yamaguchi upset top seeded Adrian Alle of Australia in the men’s 80s. I will add to this blog during the week.